Senior guard Nate Axelrod (Dublin/Coffman) scored 17 points and senior guard Seth Clark (Lewis Center/Olentangy) added 15 more as the Ohio Wesleyan men’s basketball team built a 28-point halftime lead and went on to defeat Allegheny 99-64 in a North Coast Athletic Conference matchup on Saturday at Branch Rickey Arena. 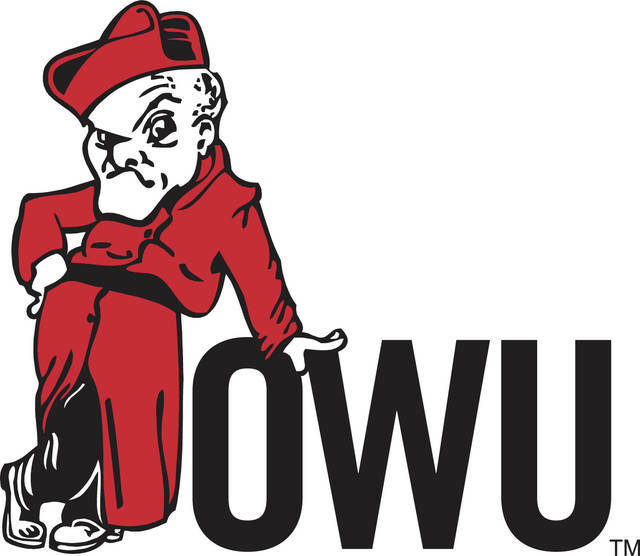 With the win, Ohio Wesleyan will be the No. 3 seed in the upcoming NCAC tournament and will host a tournament quarterfinal game at 7:30 p.m. on Tuesday at Branch Rickey Arena. Axelrod drove for a pair of lay-ins and senior wing Will Orr (Johnstown/Johnstown-Monroe) had another as the Bishops took an early 6-2 lead, but a 3-pointer by Jordan Rawls brought the Gators within 6-5, and after Clark connected on a 3-pointer, Billy Urso answered with a long ball that brought the Gators within a single digit just under 5 minutes into the action. Ohio Wesleyan then started to heat up from outside, with Axelrod and Clark drilling 3-pointers before Orr hit from downtown on consecutive possessions to stretch the margin to 21-12. Rawls and Nijon Kirkman worked for lay-ins to bring the visitors within 21-16, but another barrage of 3-pointers, with sophomore guard Jaret Gerber (Worthington/Thomas Worthington) connecting twice and Axelrod once, pushed the lead into double digits before Gerber drove for a lay-in that made it a 32-16 game with just over 6 minutes to play in the half. The Bishops closed out the first half with a 19-4 run that included a 3-pointer by freshman wing Dawsin Tillman (Bellefontaine), a lay-in and a 3-pointer from Axelrod, and a pair of 3-pointers and a traditional 3-point play by Clark before Axelrod sank a pair of free throws in the final second of the period. Allegheny rallied early in the second half, assembling a 7-0 run as Rawls contributed a lay-in and a 3-pointer and Brendan O’Toole hit a jumper from the lane, but that was as close as the Gators would come. Gerber led the Bishops with a career-high 20 points. Axelrod finished with 19 points and a team-best 6 assists, Clark added 18 points, and Orr scored 11 points. Clark, senior wing Law Jones (Powell/Olentangy Liberty), senior post Adam O’Brien (Wooster), Tillman, and sophomore post Grant Gossard (Westerville/Olentangy Orange) each had 5 rebounds, with that figure representing career bests for Jones and Tillman and matching O’Brien’s career high. Ohio Wesleyan launched 57 shots from behind the arc, breaking the NCAC record of 56 set by Oberlin against Case Reserve on Jan. 5, 2005; the school record of 53 set earlier this season against Ramapo; and the arena record of 50 set against Lynchburg on March 5, 2016. The Bishops connected on 23 shots from long range, tying the arena record set against DePauw earlier this season. The team’s 3-point field goal percentage of .404 established an arena record for 50 or more attempts. Rawls led Allegheny with 14 points and 11 rebounds. Sophomore guard Nicole Popovich (Rocky River) and sophomore post Elea Karras (Bellbrook/Miami Valley) scored 3 points apiece as Ohio Wesleyan opened the second half with an 8-0 run to take the lead, but Allegheny countered with an 18-2 run and went on to a 53-40 North Coast Athletic Conference win over the Bishops on Saturday at Branch Rickey Arena. Ohio Wesleyan had erased an early 6-0 deficit, closing to within 6-5 midway through the first quarter and then getting a pair of lay-ins from sophomore guard Claire Sterling (West Jefferson) and buckets from sophomore guard Meghann Dunning (Mentor/Lake Catholic) and Karras during an 8-2 run that gave the Bishops a 13-12 lead midway through the second period. The Gators retook the lead on a Brooke Smith 3-pointer, and another Smith trifecta and a pair of Rylee Donovan free throws helped the visitors take a 22-18 advantage into the locker room. Karras drove for a lay-in on the Bishops’ opening possession of the second half and Sterling followed with a hoop before Popovich and Karras each split a pair of free throws. When Popovich drove for a lay-in with 6:23 left in the quarter, Ohio Wesleyan was ahead, 26-22. Allegheny scored the next 10 points of the contest, with Delaney Arbore and Zoe Soilis hitting lay-ins before Julianna Skowron added a pair of buckets and Arbore scored on a fast break. Popovich scored on a fast break to end the Gator run and bring the Bishops within 32-28, but the visitors would score the final 8 points of the period, with Smith connecting from long range and Arbore converting a 3-point play during the final seconds of the period to increase the Allegheny lead to 40-28. Smith drove for a pair of lay-ins and Arbore added a 3-pointer early in the fourth quarter, and the lead would remain in double digits for the remainder of the contest. Popovich led the Bishops with 13 points and 12 rebounds. Karras finished with 10 points. Arbore led Allegheny with 18 points.